Vancouver, BC, July 26, 2016 – Mirasol Resources Ltd. (TSX-V: MRZ, OTCPK: MRZLF “Mirasol”) is pleased to announce encouraging intersections of Au+Ag mineralization in shallow reverse-circulation (RC) drilling at the 100% owned Claudia project in Santa Cruz Province Argentina. These preliminary results are from the drilling campaign just completed by Joint Venture partner Cerro Vanguardia S.A. (CVSA – 92.5 % owned by AngloGold Ashanti, the controlling shareholder, and 7.5 % by Fomicruz S.E., the Santa Cruz provincial mining company). 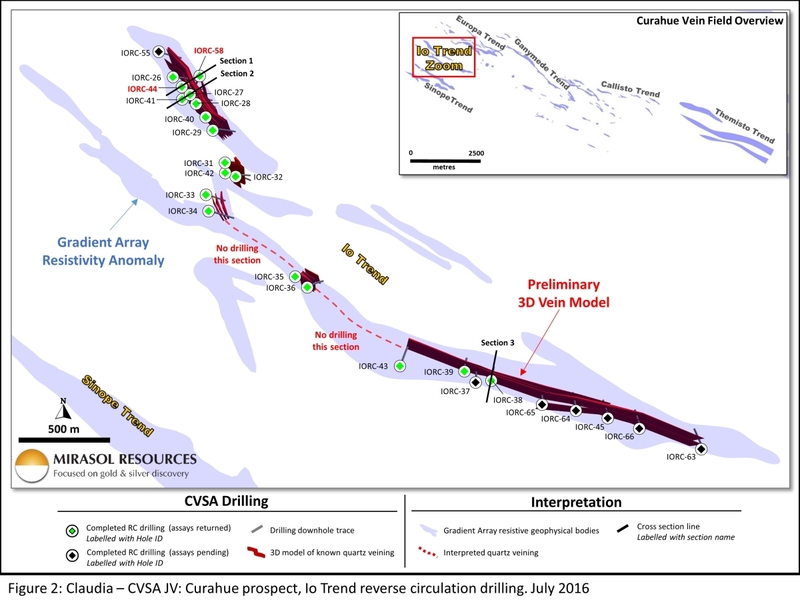 Since commencing drilling during May 2016, CVSA has completed 39 shallow RC drill holes totaling 3,543 m across the Curahue prospect, primarily focused on the “Io” trend (Figure 1). Assays have been received for 18 of the 26 RC holes that provide a shallow test of the 2 km long “Io” vein zone in the Curahue prospect. Curahue is one of five prospect areas identified within the Claudia project (Figure 2), and is defined by a 15 km long Au+Ag bearing epithermal vein corridor where Mirasol exploration has outlined six large, previously undrilled, vein trends, including: Io, Europa, Sinope, Calisto, Ganymede and Themisto (see news release July 27, 2015 Claudia Project Summary). Gradient array geophysical surveys previously conducted by Mirasol at Curahue have proved to be a very reliable tool for targeting veins concealed by gravel on the “Io” trend. The current RC drilling campaign has tested some of the high-priority “Io” trend targets to depths of between 20 and 120 m below surface and intersected a series of sizable epithermal veins and stockworks. Interpretation of preliminary cross-sections suggest the “Io” vein zone attains estimated maximum true widths ranging up-to approximately 40 m.
The majority of the assay results received to-date are from the northwest-end of the “Io” trend where the primary vein zone is interpreted to reach its maximum true width ranging up to approximately 40 m in the RC drilling. 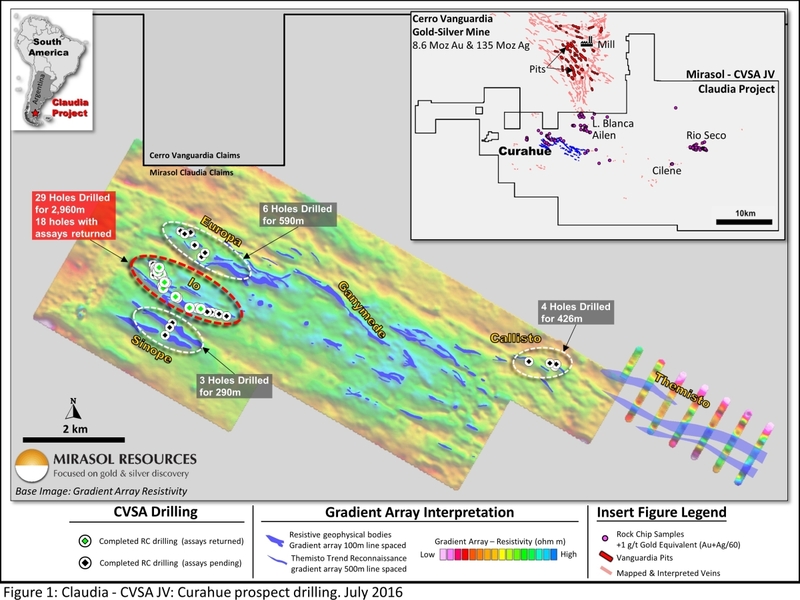 In the southeast area where assays are still pending, drill logs record narrower but still significant vein development with downhole intersections suggesting a vein zone of up to 5 to 15 m wide. The assay results from hole IORC-38, the most southeasterly hole with results to date, has returned the highest-grade intersection of 0.5 m at 7.35 g/t Au and 448.9 g/t Ag, suggesting there is potential for further mineralized intersections in this part of the vein zone. The central portion of the “Io” trend remains largely undrilled at this time. 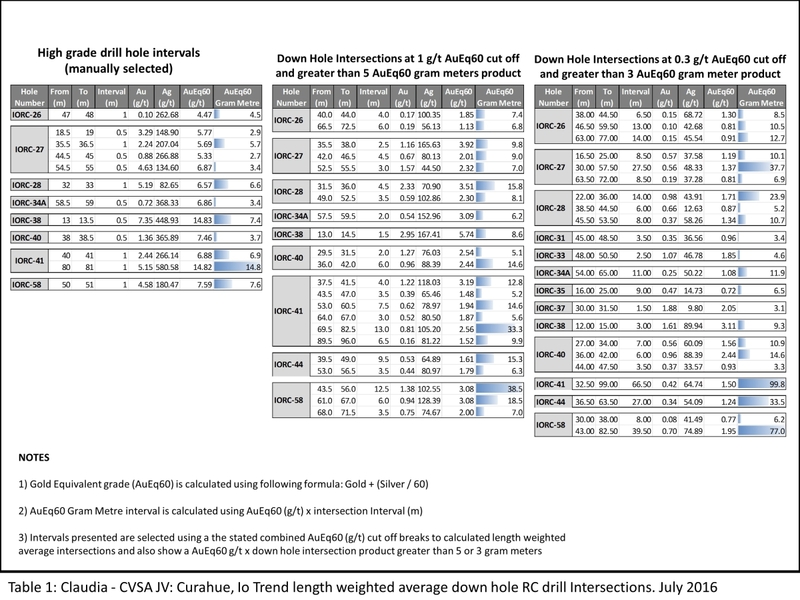 Preliminary cross section down-hole assay plots (Figure 3) of the “Io” RC drill results combined with Mirasol trench channel-sample assays suggest that the Au+Ag grades may be increasing with depth; however deeper drilling will be required to determine if this Au+Ag grade trend continues. Drill logs show the “Io” structure and associated Au+Ag mineralization is oxidized, an early indicator for potentially favourable metallurgical characteristics to the mineralization. RC drilling has been used by CVSA to provide a rapid test of the Curahue prospect. The majority of mineralized intervals from reported RC holes were collected from below the water table resulting in wet samples. “Wet” RC drilling under some circumstances can deliver lower sample recoveries and may produce smearing of samples. Given these possible uncertainties caution in interpreting these results is advised until confirmation is provided by the diamond drill core results. None the less Mirasol’s management is encouraged by these assay results that provided an initial near surface test at “Io” suggesting potential for both mill and near surface heap-leach type Au+Ag mineralization at Curahue. This phase of the RC drilling at Curahue was completed on June 29, with CVSA promptly commencing follow-up diamond core drilling at the prospect. Diamond core holes will initially target depth extensions of the mineralization intersected in RC holes at the “Io” trend but will also test sections of the Europa, Calisto, Sinope and the as yet un-drilled 3 km long Themisto trend. Assay results are currently pending for a further 8 RC holes from “Io” and 13 holes for the other trends; 6 holes from Europa, 4 holes from Calisto and 3 holes from Sinope. These results will be reported as they are delivered to Mirasol by CVSA. The Claudia – CVSA Joint Venture is targeting Au+Ag mineralization that could be mined and processed through CVSA facilities located 28 km over flat terrain to the north of Curahue, through Claudia project and CVSA lands. The objective is to identify higher-grade material that could be trucked to the mill and / or lower-grade ore suitable for an on site heap-leaching, which could be rapidly brought into production using the established mine infrastructure. The Cerro Vanguardia Mine produced 300,000 oz of Au during 2015 and over 1.25 Moz Au in the last five years, mining from a series of open pits, heap leach and underground operations. 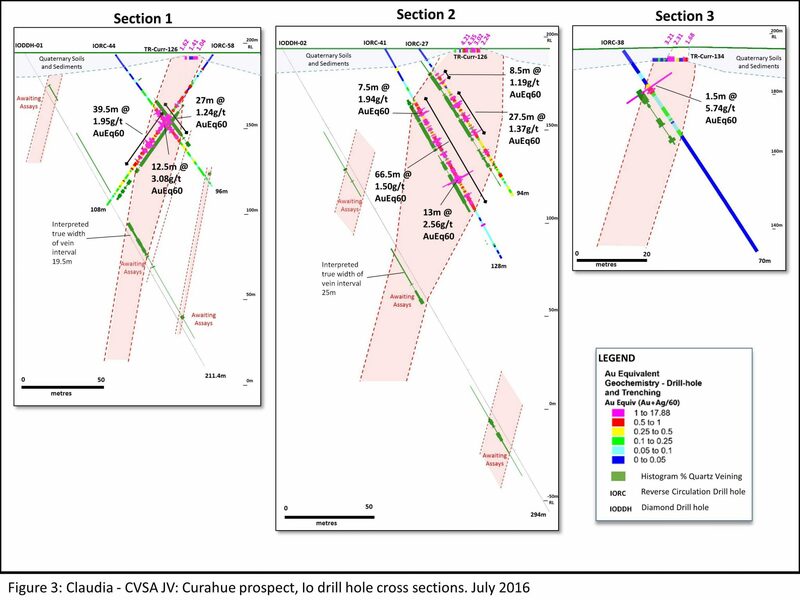 The Claudia – CVSA Joint Venture (see new release March 01, 2016) requires CVSA to drill 12,000 m, spend US$5 million on exploration and pay US$1 million in staged cash payments over 2 years to earn 51% of the Claudia project. CVSA can earn up to 75% of the project over six years by delivering a decision to mine with a minimum resource of 350,000 oz Au and provide funding to production for Mirasol’s 25% equity proportion of the mine. The earn-in timeline can be accelerated at CVSA’s discretion by early delivery on the drill, exploration spend and payments schedule. Under the terms of the Claudia-CVSA Agreement, all exploration is managed by CVSA. All previous exploration on the projects was supervised by Mirasol CEO Stephen C. Nano, who is the Qualified Person under NI 43-101. All information generated from the Claudia-CVSA Joint Venture program is reviewed by Mirasol prior to release. The technical interpretations presented here are those of Mirasol Resources Ltd.
CVSA applies industry standard exploration methodologies and techniques. All geochemical rock and drill samples are collected under the supervision of CVSA’s geologists in accordance with industry practice. Geochemical assays are obtained and reported under a quality assurance and quality control (QA/QC) program. Reverse circulation samples are collected at the drill rig either with a dry or a wet hydraulic splitter. Samples were collected on 0.5, 1 and 2m intervals decided upon by the site geologist. The Reverse circulation samples are split into two samples at the CVSA mine laboratory where one split is assayed by the mine laboratory for quick turnaround of results to provide feedback for the program and the other split dispatched to an ISO 9001:2000-accredited laboratory in Argentina for analysis. CVSA supplied to Mirasol the independent accredited laboratory analysis results only and these are reported here. Au is assayed by 50g Fire Assay with an AAS finish. Ag is assayed by a multi-acid digest with an ICP finish and results > 200 ppm were reassayed by 50g Gravimetric method. Assay results from reverse circulation samples may be higher, lower or similar to results obtained from surface samples due to surficial oxidation and enrichment processes or due to natural geological grade variations in the primary mineralization.